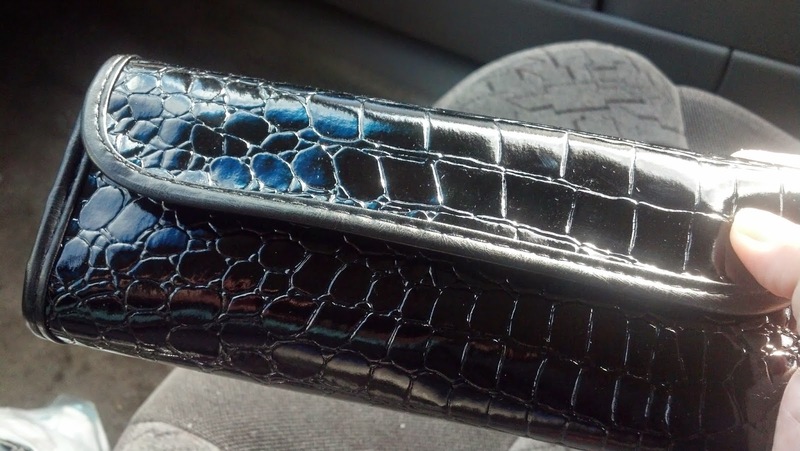 Petunia Skincare's Professional 12 Set Makeup Brush Kit is a set of 12 high quality brushes that come in a black faux-crocodile travel pouch. This kit is the complete set - it includes everything from the standard powder and blush brushes to lip and eyeliner brushes and even a fan brush for highlighter or bronzer. This is by far one of the most comprehensive brush sets that I have seen - it goes beyond the basics and includes everything you need to apply makeup. I am very impressed with the softness and quality of the brush heads - some are synthetic, some are goat hair, and some are pony hair. They pick up powder really well and distribute it evenly across my face. I'm also really impressed with variety and style of brushes - from an eyebrow brush to eyeliner and even a concealer brush. The angle and edge of the concealer brush works really well to get into every little crevice and completely cover blemishes. It's also nice because then you're not using the oils from your fingers to irritate blemishes even more. 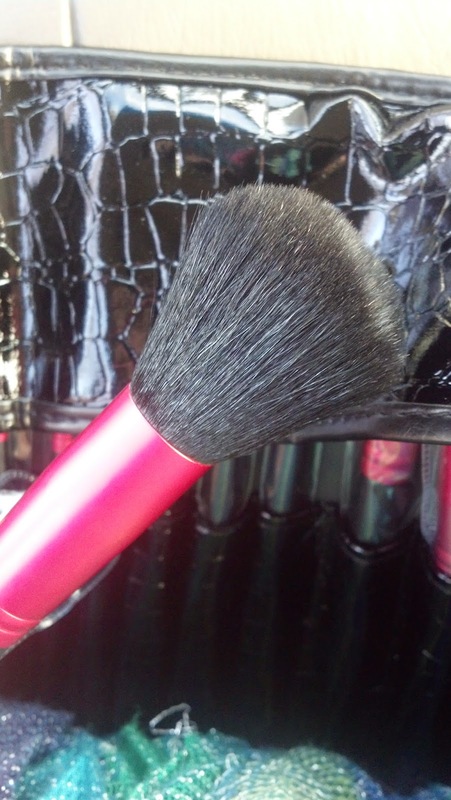 I also love the fan brush for highlighter or bronzer powder. I've never had a fan brush before but it works great for lightly dusting your face with a hint of bronzer so you get that sun-kissed look without going overboard. One thing I thought was odd was that the flat large brush with white tips is being called a blush brush and the fluffy black angled brush is called a foundation brush. To me, at least in my personal experience and opinion, I find that the angled brush works better for blush and the flat brush makes more sense for liquid foundation. Maybe it's just me, but that's what I would recommend. This kit also comes with protectors for the brushes so that they don't lose their shape or quality. 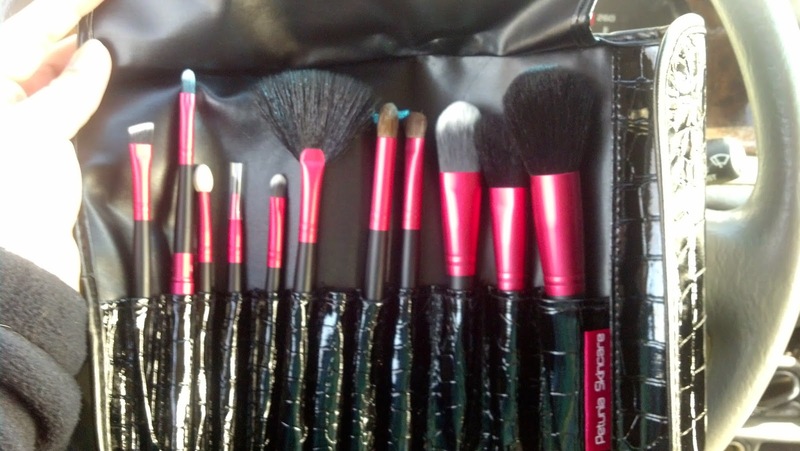 I love the little clutch that the brushes come in - it's great for travel and looks cute too. Plus it keeps the brushes all in one spot so you don't lose them. Overall, I really like these brushes and think that this is a complete, quality set for both amateur and advanced beauty buffs. Plus, Petunia Skincare is a member of PETA, so they don't test on animals and no animals were harmed to create these natural brushes.